Tonight we have made Middle Eastern cooking ultra simple using a traditional spice, Zahtar! Zahtar spice may be making its debut in your kitchen tonight, but we think it might be one to stay. This spice has a tangy, nutty flavour and is made up of thyme, sesame seeds and - the secret ingredient - sumac! Zahtar tastes amazing sprinkled over meat, veggies and salmon in particular; we hope you enjoy this taste sensation! Remove the top and bottom from the courgette. Cut the courgette into four long strips. 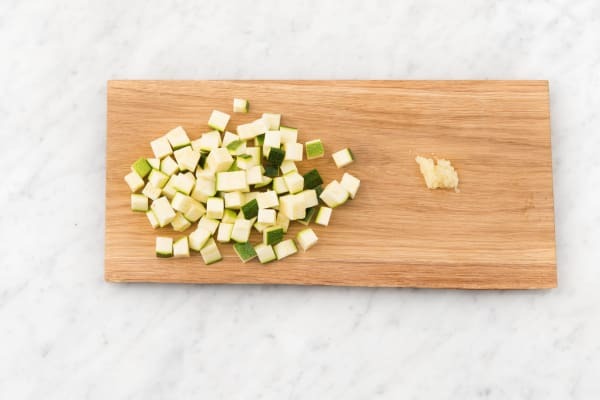 Chop each strip into 1cm chunks. Peel and grate the garlic (or use a garlic press if you have one). Heat a frying pan over medium heat and add a splash of oil. When the oil is hot, add your courgette and cook for 3 mins. Add your garlic and cook for 1 minute more before adding the basmati rice. Stir to coat your rice in the garlicky oil. Add the water (amount specified in the ingredient list) to the pan along with the vegetable stock pot and bring to the boil. Stir to make sure your stock pot dissolves. Once boiling, reduce the heat to medium, pop the lid on and cook for 10 mins. Whilst your rice cooks, get on with the rest of your prep. 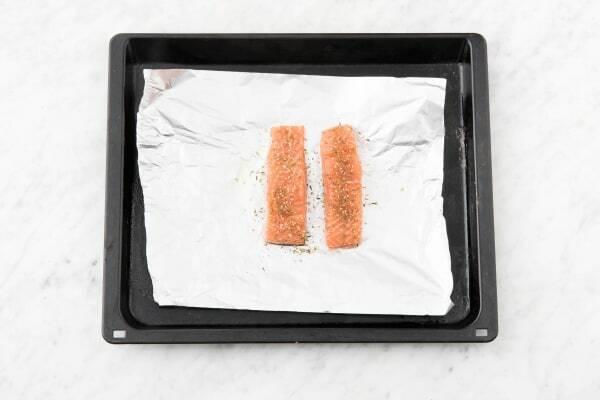 Place the salmon (skinside down) on a foil lined baking tray and sprinkle over half of the zahtar spice. Use your hands to make sure the zahtar spice is evenly spread over each salmon fillet. Season each fillet with a pinch of salt and keep to one side. Preheat your grill to its highest setting. When your rice has been cooking for 10 mins, remove the pan from the heat, pop in the baby spinach and put the lid back on. Leave the pan to one side for 10 mins. 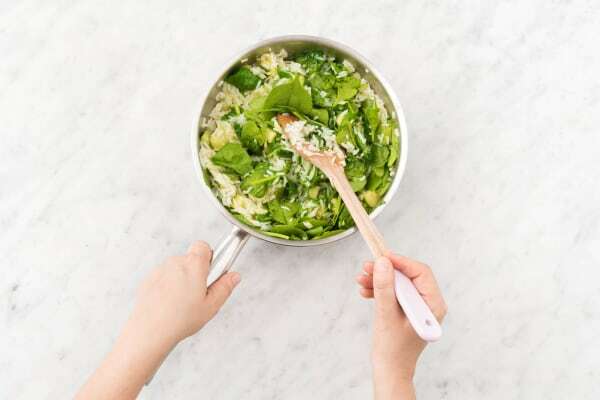 The steam in the pan will finish cooking your rice and wilt your spinach. Zest and juice the lemon. 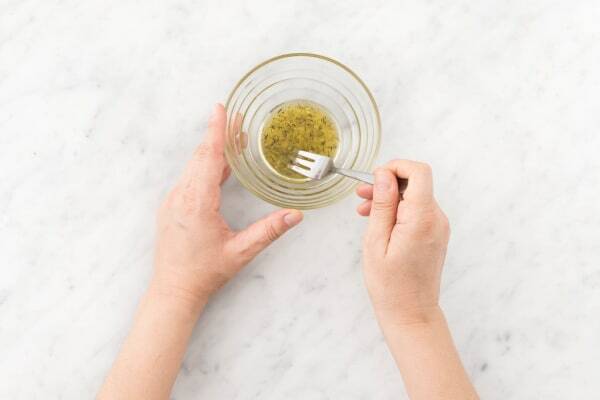 Mix the remaining zahtar spice with a pinch of lemon zest and 1 tbsp of oil per person. Season with a pinch of salt and stir well. Put your salmon under your grill and cook for 8-10mins. Tip: The salmon is cooked when the centre is opaque. Once your salmon is cooked, remove the tray from under your grill and add a dash of lemon juice. Finish your rice by mixing through the ground coriander. Taste and season with salt and black pepper if you feel it needs it. Add a dash of lemon juice and a pinch of lemon zest if it needs a bit of zing! 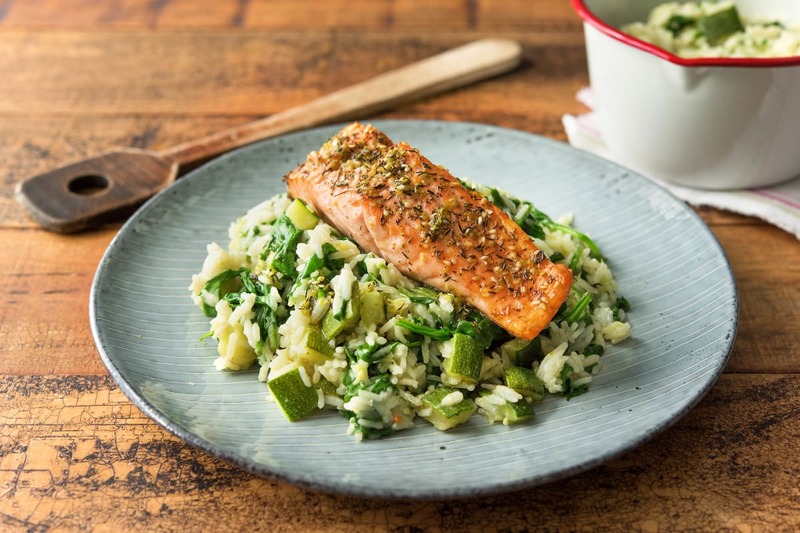 Serve your salmon on top of a bed of your fragrant rice and finish with a drizzle of your zahtar dressing. Enjoy!